Fig. 1 The schematic of experimental system from both countries and image sequences of cavitation onset and bottle fracture by acceleration for each experiment (impact from the bottom (a, b) and from the top (c, d). More details can be found in Pan, Kiyama, et al., PNAS, 2017(5)). h, pr, and pb respectively indicate the depth of liquid column, the internal pressure, and the liquid pressure at the tube bottom. g indicates the direction of gravity. This figure is cited from the proceeding of the annual meeting of JSME 2017(1). (1) 木山景仁，Zhao Pan, 田川義之，Jesse Daily, Scott Thomson, Randy Hurd, Tadd Truscott, 液体急加速時における新しいキャビテーション数の提案，日本機会学会2017年度年次大会講演論文集, (2017), J2410205. (3) Kiyama, A., Tagawa, Y., Ando, K. and Kameda, M., “Effects of a water hammer and cavitation on jet formation in a test tube”, Journal of Fluid Mechanics, Vol. 787 (2016), pp. 224-236. 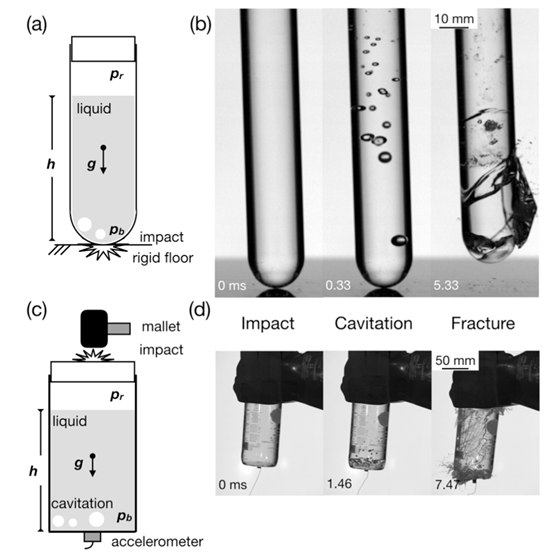 (4) Daily, J., Pendlebury, J., Langley, K., Hurd, R., Thomson, S. and Truscott, T., “Catastrophic cracking courtesy of quiescent cavitation”, Physics of Fluids, Vol. 26, No. 9 (2014), 091107. (5) Pan, Z., Kiyama, A., Tagawa, Y., Daily, J., Thomson, S., Hurd, R. and Truscott, T., “Cavitation onset caused by acceleration”, Proceedings of National Academy of Science, Vol. 114, No. 32 (2017), pp.8470-8474. (6) 木山景仁，野口悠斗，田川義之，“撃力による液体ジェットの生成(ジェット速度に関する実験的研究)”，日本機械学会論文集，Vol. 80, No. 814 (2014), FE0151.